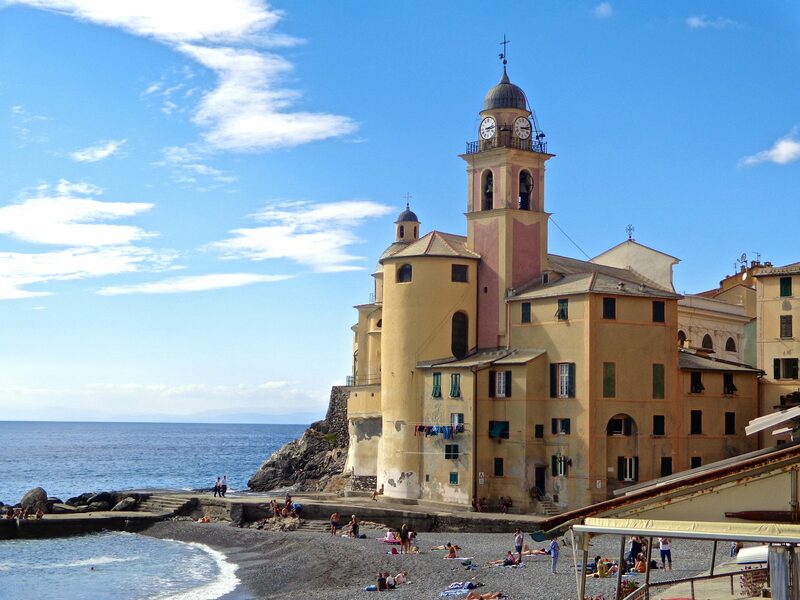 It all started in Naples, typically alive with activity. Shop proprietors were busy selling their wares while lines of hungry people formed in front of several small pizzerias for a lunchtime snack. All was bustling and full of the sights, sounds and smells that make Naples uniquely what it is. Before long I found my funicular, Centrale to Piazza Fuga. 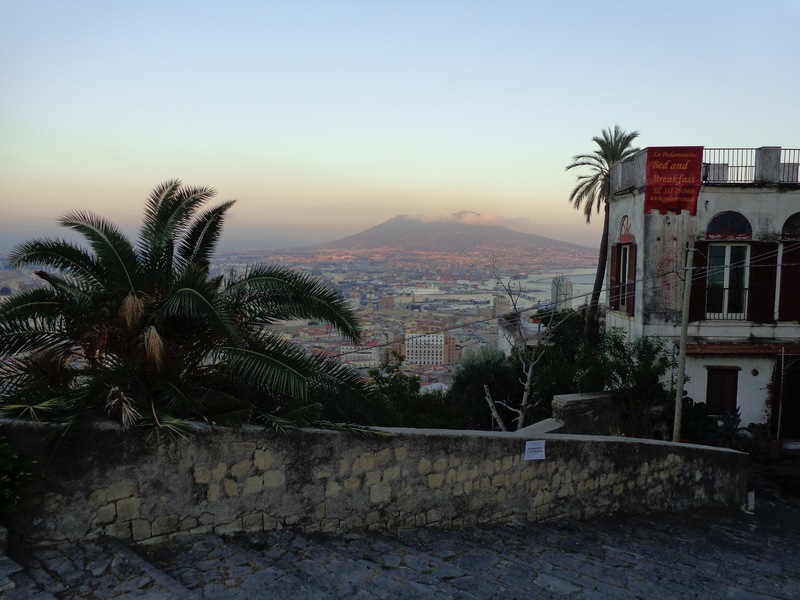 It would take me up to San Martino, a neighborhood of Naples high above the city. After arriving in San Martino, I bumped into Giovanni on the road leading up to Castello San Elmo. His genteel manner and friendly countenance put me at ease immediately, and I found him easy to talk to. 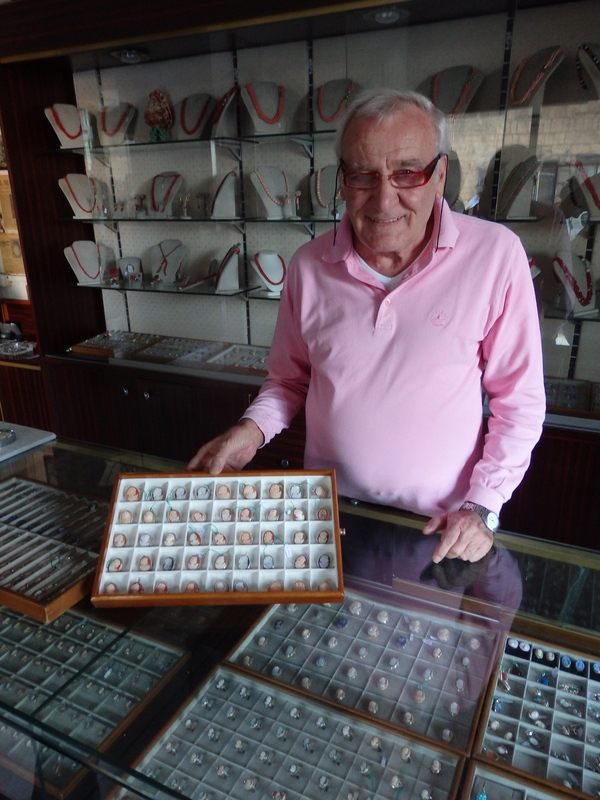 We immediately engaged in a lively chat and soon ended up at his shop, De Paolo Cameo factory. I was delightfully amazed. 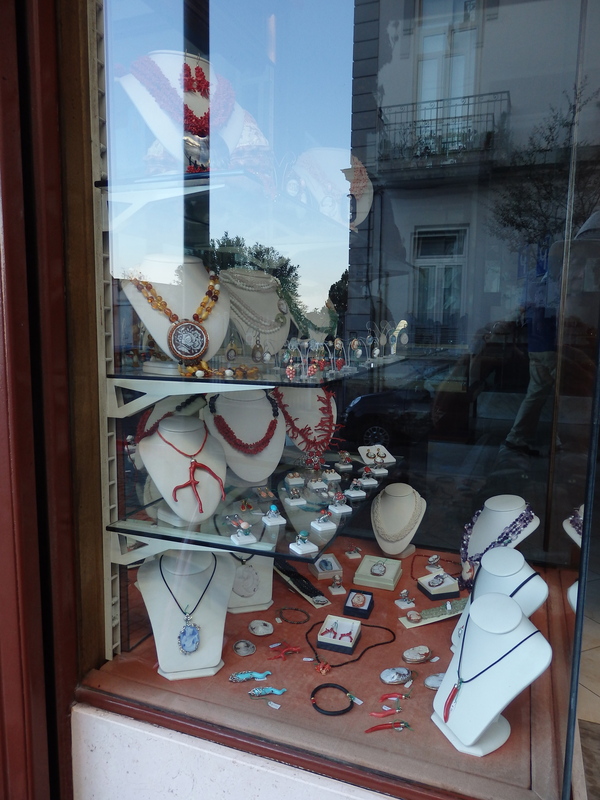 The shop windows were alive with many mother-of-pearl cameos, all delicately carved into beautiful ladies, mythical creatures and lovely flowering scenes. But that wasn’t my only surprise! Here I am surrounded by Giovanni (far left) his brother, and ‘Jack Nicholson’ on the far right inside the Cameo factory. After stepping inside the small shop, I was greeted with warm smiles by Giovanni’s two brothers. One looked a lot like Jack Nicholson. I never said a word to him about it, but when he sold me one of his prize cameos, he gave me a wink and assured me I could tell others that ‘Jack Nicholson’ sold me a cameo. The shop was fascinating. I learned that the tradition of making cameos had remained in the family for three generations, keeping the Neapolitan tradition of cameo engraving alive and lucrative. 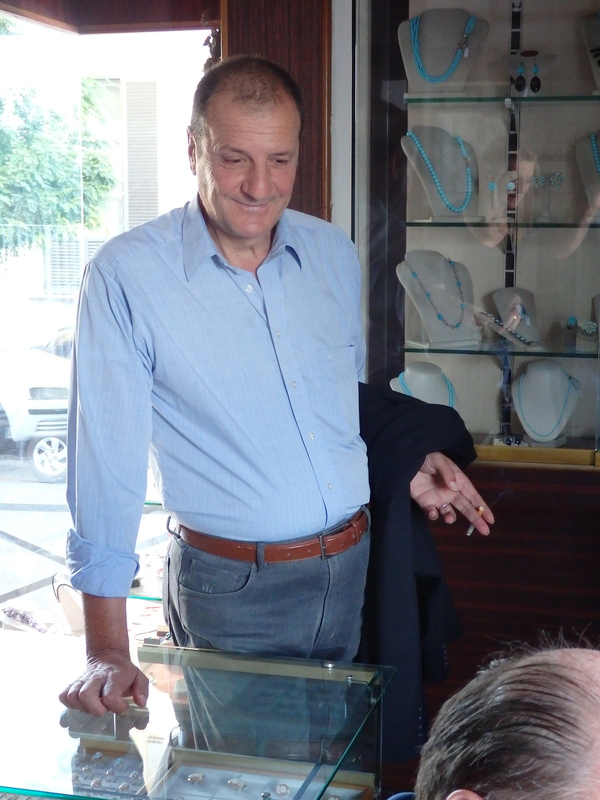 Vincenzo De Paolo, founder and CEO, opened shop in 1932 and since then has kept up the passion, pride and uniqueness of product that has built a legacy of this creative family tradition. ‘Jack’ (never caught his real name) was carving a cameo just inside the door of the shop. It was very intriguing to watch the fine etching that turned each shell piece into a lovely design. There were no two alike. Two types of shells are used. One is the Sardonic, coming from the Caribbean or the Bahamas, with a brown underside that enables clear incisions. The other is called the Carnelian, which tends toward red tones, of Africa origin. Displays of many beautiful cameos made right here and lin the upstairs factory. 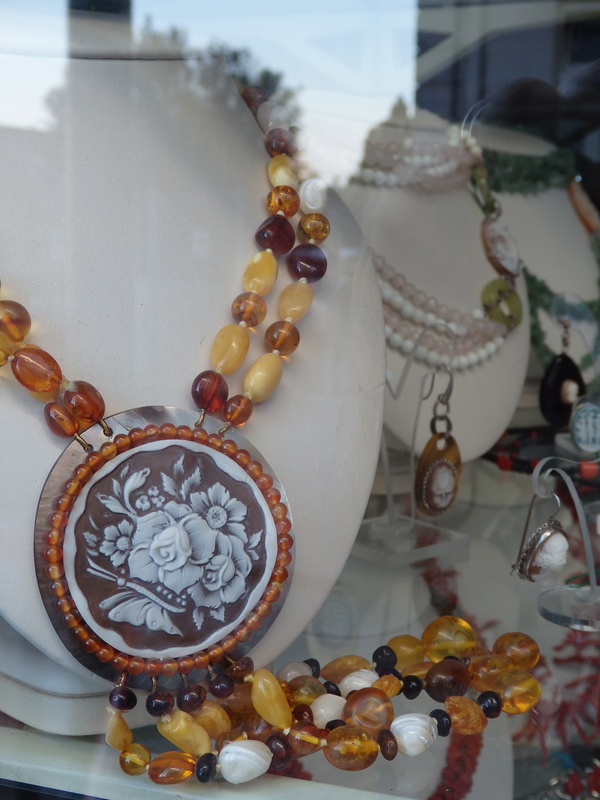 Necklaces, earrings, pendants and bracelets were all bedecked with cameos portraying intricate flowers, female profiles and mythological figures from vintage to modern. Upon closer inspection, I was very impressed by the delicate detail of hair curls and facial expressions. Vibrant displays of coral necklaces and earrings were sprinkled throughout the displays. Interestingly enough, coral has been found in the Etruscan excavations and paintings. 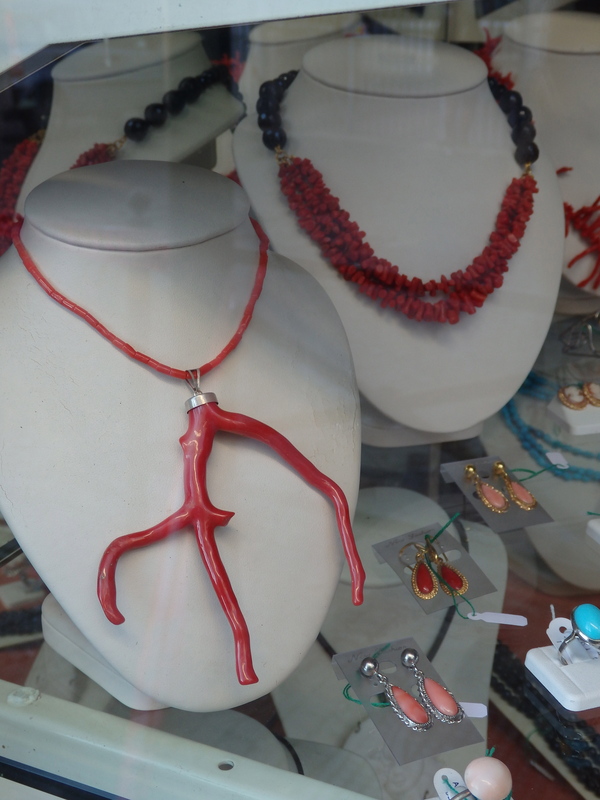 I found that even today many people believe coral contains strong healing powers and helps to keep disasters at bay. Coral has always been in vogue, it seems, and is quite striking in appearance. When I left with the hand-picked cameo necklace that ‘Jack’ sold me, Giovanni walked me down the road toward Castello San Elmo and the Museum of S. Martino which was once a monastery, built in 1368 (more on this to come later). 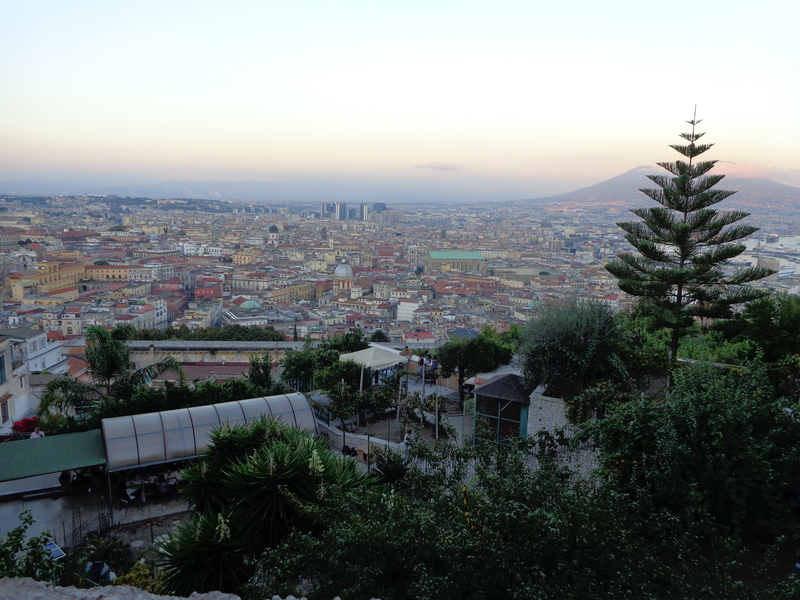 The views of Naples and the bay between these two was breathtaking and I took a number of photos. Giovanni wished me well and retraced his steps back to the shop. I stood looking down at Naples, taking in the early evening sunset that began to streak the sky with delicate cameo colors. Interesting that my wife and I had the exact experience you describe–apparently falling in by accident with Giovanni on the walk from the funicular to San Martino, description of the family business and demo by “Jack” just inside the shop door. They were very disappointed that we didn’t buy a cameo. Ha! I thought Giovanni have been be reeling me in. This confirms it. Thanks for sharing. I am glad that I bought my cameo, though. And I genuinely enjoyed my time with them. Edit… not for the main sake of photography but for the memories. Hi Rommel, thank you for the feedback. San Martino is an amazing place. Yes, cameos are expensive…I did come home with a necklace but they were nice enough to work our a good deal:) I went through the museum and remembered that I had been there before. It is amazing! And the views from the terrace….wow!! Are cameos still as popular in Italy as they once were? Now I too have a new appreciation for cameos! 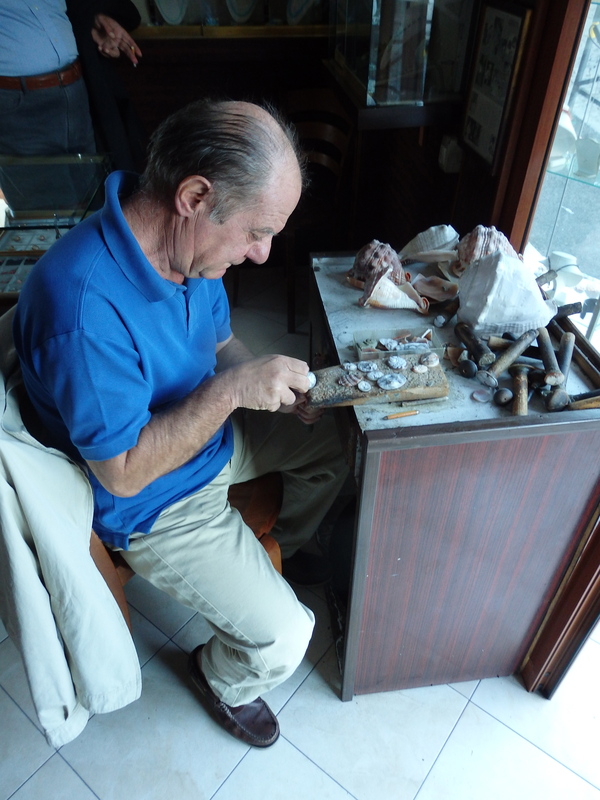 I so enjoyed seeing a small handcraft business still thriving, and seeing a small part of Naples I most likely would not otherwise. Thank you Lyn…it was a lot of fun. Never expected to be a cameo fan, but I am now!